Catholics and Protestants disagree on the hierarchy of angels, or even if there is an established hierarchy. The Catholic Church has long recognized a melding of celestial hierarchy ideas proposed by 4th to 8th-century Theologians St. Ambrose, Pope Gregory the Great, Fr. John of Damascus. Most Protestant denominations reject the idea of a celestial hierarchy or angelic order beyond Angels, Archangels, Seraphim, and Cherubim. Actually, Dionysius the Areopagite , a supposed Christian Theologian and Philosopher, presented the most influential angelic classifications in his book "De Coelesti Hierarchia" ("The Celestial Hierarchy"). One of the reasons Dionysius' "The Celestial Hierarchy" gained such acceptance in the late 5th and early 6th centuries is because many believed it to have been written centuries earlier by the Biblical Dionysius, a first-century Greek who was converted by the Apostle Paul (Acts 17:34). At the time, "The Celestial Hierarchy" was considered authority, almost equal to the Bible, because they believed Paul had taught Dionysius the special revelation about angels from his visions when he was caught up in the "third heaven" (2 Corinthians 12:2). The Bible identifies several different kinds, classes, or functions of angelic beings. Most people know about Seraphim, Cherubim, Archangels, and Angels; but how many understand, when the Bible speaks of "thrones", "strongholds", "dominions", "virtues", or Ezekiel's "wheels-within-a-wheel", that it may be referring to actual living beings? So, the question is: Are they separate living beings or are they only designations of functions that can, and sometimes do, apply to all angelic beings? If we acknowledge or accept the nine orders of angelic hierarchy  as put forth in the tables above  then technically speaking, no, they're not all "angels". However, if you reject the notion of a celestial hierarchy and suppose all of these designations are merely jobs within the angelic realm, then we may agree that they are all angels with a variety of functions. Protestants  or more accurately, opponents of a specific angelic hierarchy  point out that the different words used to rank these celestial beings are never found together in one place. Rather, the Apostle Paul lists five, but not all nine of the proposed hierarchy, and the Apostle Peter lists only three. There is no indication in Scripture that the different designations or attributes represent actual ranks. Rather, Protestant Theologians maintain that the nine terms describe the various functions of angels, but not ranks. To help you understand the difference between rank and function, think of an Army where members are ranked from Private to General. Let's assume the General's driver is Private Smith. On any given day, we might find Private Smith washing the motor pool [garage and vehicle service area] floor in the morning and driving the General to his staff meeting in the afternoon. The next day, Private Smith is cleaning the equipment and tools in the motor pool in the morning, washing the General's vehicle in the afternoon, and guarding the motor pool at night. Although there are five different tasks being accomplished, there are not five Private Smiths. Rather, there is one Private Smith [rank] doing five different tasks [function] according to the General's needs or assignments. Considering that we live in a world where man-made bureaucracy is the status quo and much energy is expended in trying to attain to the upper echelons, it is only natural for us to try to assign ranks to all things, whether real, imagined, or spiritual. In that brief passage, Paul acknowledges that we exist in mortal bodies subject to and conscious of imperfections and frailties that affect  and sometimes afflict  all humankind. Scripture teaches that we each have a spirit housed in an imperfect flesh-and-bones body. Thus, we must battle according to the spirit and not the physical. Everything associated with our bodies is temporal. It's our spirits and souls that will live on long after our bodies have succumbed to that physical death that afflicts all mortals [and that will be given new bodies in the Resurrection or the Rapture of the Church]. Therefore, our battle against sin, idolatry, and all forms of evil must be waged in the spirit. We must look to a source, or sources, outside of ourselves with which to overcome and conquer the temptations and sins that so easily beset us. We dare not think we can overcome them by our own intellect or effort! Paul says in the verses above that the weapons of our warfare "have divine power to destroy strongholds." Let's look at other verses that speak of spiritual warfare. In 2 Corinthians 10:4 above, Paul mentions "strongholds". In the passages in Ephesians, Colossians, and 1 Peter we see a list of other various beings. The fact that the Apostles Paul and Peter use different names or titles for these beings, we may logically and correctly deduce these are not all the same work or function. But can we say with 100% assurance that these also reveal six different classes of celestial beings? Is this a place where the Bible doesn't explicitly tell us something, but implicitly reveals it? The idea of a celestial "hierarchy" conjures images of one level or position being somehow either superior or inferior to another. Such is definitely not the case, neither is it Biblical. strings (violins, violas, cellos, etc.). Depending on the composition being played, one or two instruments may be featured over others. Does this make those featured instruments more important or of more value? No. Regardless of what the composition is, all of the instruments bring the harmonic flexibility necessary to create something that would not be possible without all the instruments doing their part  sometimes in the lead and sometimes in support of others. Such is the case when we discuss angelic hierarchy. In God's creation, we can see a natural order or hierarchy at play in every animal and plant. So, it is instinctive for us to assume the same is true for the angelic realm. But really, would the God "who shows no partiality" (Romans 2:11), not even "to princes, nor regards the rich more than the poor" (Job 34:19), assign a ranking system among the angelic beings that would seem to favor one group over another? Would He not extend the same grace toward His celestial beings that He extends to humankind? Really, it seems that the "ranking" among these superior beings depends entirely upon the task at hand; but their ranks  if such exist  in no way infers that any of these beings is superior or inferior to any others. Don't make the common mistake of thinking that the "rulers", "authorities", "powers", "dominions", etc. always refer to Satan and his demons. Nothing could be further from the truth! In fact, when God's Word assures us "he who is in you is greater than he who is in the world" and tells us that they are all subjected to Jesus Christ, it's making the point that we have some very strong allies! There is an old adage concerning warfare that says: "Know your enemy!" But for the purpose of logically and correctly waging war in the spiritual realm, I would take it a step further and say, "Know your allies!" Remember, Scripture says that Satan "masquerades as an angel of light" (2 Corinthians 11:14); so it is no small or unimportant matter to be able to discern God's angels from Satan's demons! In this lesson, we will look at the various functions performed by angelic beings who minister to and on behalf of God  our allies  and we will examine our spiritual enemies  Satan and the other fallen angelic beings  in the next lesson. 15"When the servant of the man of God got up and went out early the next morning, an army with horses and chariots had surrounded the city. 'Oh, my lord, what shall we do?' the servant asked. As we dig deeper into this interesting subject, we will not only increase our knowledge of the spiritual realm, but we will be encouraged by the sure knowledge of a vast Heavenly force whose mission it is to assist us in carrying the Gospel of Jesus Christ to the world. As we have been discussing in this lesson, there is much controversy concerning the assignment of rank or hierarchy to the angelic. In our study of this subject, we find that there are five angelic beings about whose forms and features the Bible provides significant details. For the remaining four, however, their descriptions deal with function only, not form. Thus, for the purposes of this lesson, we shall study the Seraphim, Cherubim, Wheels/Ophanims, Archangels, and Angels as distinct classes, but none being superior or inferior to another. Then, we'll study the other four designations dealing with function: Virtues/Strongholds, Dominions/Elders, Powers/Authorities, and Principalities/Rulers. The word "seraph" in Hebrew is translated "fiery one" or "burning one" and is sometimes a synonym for "serpent" or "fiery serpent" in the Old Testament. "Strong's Hebrew Dictionary" offers: "saw-rawf' burning, that is, (figuratively) poisonous (serpent); specifically a saraph or symbolical creature (from their copper color):  fiery (serpent), seraph." See also Isaiah 14:29; 30:6. When thinking about the Seraphim burning with love and zeal for God, recall the story in Exodus 34 about Moses' skin shining so brightly after meeting with God that the people were afraid to look at him? 29"When Moses came down from Mount Sinai, with the two tablets of the testimony in his hand as he came down from the mountain, Moses did not know that the skin of his face shone because he had been talking with God. 30Aaron and all the people of Israel saw Moses, and behold, the skin of his face shone, and they were afraid to come near him. 31But Moses called to them, and Aaron and all the leaders of the congregation returned to him, and Moses talked with them. 32Afterward all the people of Israel came near, and he commanded them all that the LORD had spoken with him in Mount Sinai. 33And when Moses had finished speaking with them, he put a veil over his face. In Isaiah 6:2-3, the Seraphim are positioned above the LORD, ready to minister to Him as He sits upon His throne. 2"Above him [the LORD]3And one called to another and said: 'Holy, holy, holy is the LORD of hosts; the whole earth is full of his glory!'" The Seraphim primarily serve as the caretakers of God's throne. Thus, they continuously declare His praises. God's grace flows through the Seraphim to the other Angels, dispelling darkness and purifying the universe. No doubt, you have seen pictures of cute, chubby babies with wings that are supposed to represent the Cherubim [plural of "cherub", also "cherubs"]. However, the Bible tells a very different story about Cherubim. The first mention of Cherubim is in Genesis 3:24 which says: "He [God] drove out the man, and at the east of the garden of Eden he placed the Cherubim and a flaming sword that turned every way to guard the way to the tree of life." 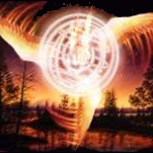 Cherubim are celestial beings, or symbolical representations on earth of spiritual beings in the Heavens. In the Bible, the Cherubim are largely symbolic, intended to represent spiritual existences in immediate contact with the LORD. Cherubim are mentioned in the Torah [the first five books of the Bible whose authorship is attributed to Moses], Ezekiel, and Isaiah. They are also mentioned in the books of Kings and Chronicles, mainly in the construction of the House of God. There is only one mention in the New Testament, in Hebrews 9:5, referring to the Mercy Seat of the Ark of the Covenant.4 Because of their physical similarities, some Theologians believe the "beasts" or "living creatures" in Revelation 4:8 also refer to the Cherubim. However, a quick review of the original Greek shows that the words are completely different from each other. The words "Cherub" or "Cherubim" appear in the Bible at least 95 times. Some Bibles translate the terms as "winged ones", "winged creatures", "living creatures", or "angelic sentries" [Genesis 3:24 in the NET Bible]. Ezekiel describes them in chapter 1 as having calf's feet on all sides, four conjoined multi-eyed wings to symbolize their supposed all-knowing character, human-like hands under their wings on four sides, and four faces: one of a man, an ox, a lion, and an eagle. 6but each had four faces, and each of them had four wings. 7Their legs were straight, and the soles of their feet were like the sole of a calf's foot. And they sparkled like burnished bronze. 9their wings touched one another. Each one of them went straight forward, without turning as they went. 10As for the likeness of their faces, each had a human face. The four had the face of a lion on the right side, the four had the face of an ox on the left side, and the four had the face of an eagle. 11Such were their faces. And their wings were spread out above. Each creature had two wings, each of which touched the wing of another, while two covered their bodies. 12And each went straight forward. Wherever the spirit would go, they went, without turning as they went. 13As for the likeness of the living creatures, their appearance was like burning coals of fire, like the appearance of torches moving to and fro among the living creatures. And the fire was bright, and out of the fire went forth lightning. 14And the living creatures darted to and fro, like the appearance of a flash of lightning." Be aware! The spirit realm is real! Satan and the demonic are very real, and they're out for blood! Yours! We dare not take lightly what the Bible tells and warns us about the celestial beings  whether God's or Satan's. The ox face is believed to be their true face. We say this because Ezekiel describes the Wheels [Ophanim] in chapter 10 using the same imagery of four faces as he used in chapter 1 for the four faces of the Cherubim. But in Ezekiel 10:14, he doesn't mention an ox's face, but a "cherub's face". "And every one had four faces: the first face was the face of the cherub, and the second face was a human face, and the third the face of a lion, and the fourth the face of an eagle." As we've seen already, they guarded the Tree of Life in Genesis 3:24. Cherubim are said to have perfect knowledge of God, surpassed only by the love of the Seraphim. Cherubim are God's record keepers and guardians of His glory. God instructed Moses to place gold replicas of Cherubim on the Mercy Seat on top of the Ark of the Covenant in Exodus 25:18-22 where He said He would meet with Moses. 18"And you shall make two Cherubim of gold; of hammered work shall you make them, on the two ends of the mercy seat. 19Make one cherub on the one end, and one cherub on the other end. Of one piece with the mercy seat shall you make the Cherubim on its two ends. 20The Cherubim shall spread out their wings above, overshadowing the mercy seat with their wings, their faces one to another; toward the mercy seat shall the faces of the Cherubim be. 21And you shall put the mercy seat on the top of the ark, and in the ark you shall put the testimony that I shall give you. Representations of Cherubim were also embroidered into the Temple veil (cf. Exodus 26:31; 2 Chronicles 3:7), and they lavished Solomon's Temple as related in 1 Kings 6:23-28. Why is this important? Recall that everything in the earthly Temple is symbolic, or a "type", of actual Heavenly things. So, placing images or replicas of Cherubim in the earthly Temple reinforces the idea that they are Heavenly caretakers and guardians of all things sacred. 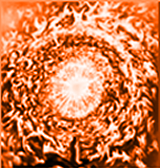 22"Over the heads of the living creatures [Seraphim] there was the likeness of an expanse, shining like awe-inspiring crystal, spread out above their heads. 23And under the expanse their wings were stretched out straight, one toward another. And each creature had two wings covering its body. 24And when they went, I heard the sound of their wings like the sound of many waters, like the sound of the Almighty, a sound of tumult like the sound of an army. When they stood still, they let down their wings. 25And there came a voice from above the expanse over their heads. When they stood still, they let down their wings. 26And above the expanse over their heads there was the likeness of a throne, in appearance like sapphire; and seated above the likeness of a throne was a likeness with a human appearance. 27And upward from what had the appearance of his waist I saw as it were gleaming metal, like the appearance of fire enclosed all around. And downward from what had the appearance of his waist I saw as it were the appearance of fire, and there was brightness around him. It doesn't take much imagination on our parts to understand that God had given to the Prophet Ezekiel a most glorious and awesome vision of His holiness and of the Cherubim serving and worshipping the Lord! If you wanted to meet with God, it would be on His terms or not at all! Many people mistakenly believe that God has changed, that He was an angry God in the Old Testament and is now a loving God in the New. But God assures us in His Word that He does not change. Although we now live in what some refer to as the "age of grace", that does not mean God has changed the rules. The saints in the Old Testament, whom the Bible calls the "children of the promise", are saved, not by their individual achievements, but by their faith in the covenant that God made with Abraham to bless all nations through his seed, that Seed, of course, being Jesus Christ. All people  past, present, or future  must come to Him on His terms, through His one and only Son who gave His life as "a ransom for many" (cf. Matthew 20:28; Mark 10:45). We see the expression of the Lord "abiding" between the two Cherubim on the Mercy Seat several times throughout the Old Testament in Numbers 7:89; 1 Samuel 4:4; Psalms 18:10, 80:1, 99:1; Isaiah 37:16; Ezekiel 10:1-20. 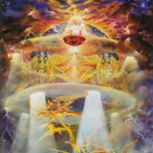 Did you know that the wheels in Ezekiel's vision are also living angelic beings? They are called "Ophanim", which derives from the Hebrew ân 'ôphân meaning "wheels". The singular 'ôphân appears 25 times in Ezekiel. Elsewhere throughout the Old Testament, the word refers to ordinary wheels such as on chariots or are used to mill grain. Unlike the Seraphim and Cherubim, who at least appear to be living beings somewhat resembling the human form, the Ophanim appear as beryl-colored [pale green or aquamarine] multi-winged wheels-within-a-wheel, the rims of which are covered with hundreds of eyes. Because of the engineering impossibility of creating a mechanically-functioning multi-winged wheel-within-a-wheel, some people [mainly scientologists] insist that what Ezekiel saw was a spaceship from another planet! They say the hundreds of eyes would be the aliens looking through the portals. Isn't it strange that some people would rather believe in aliens from other planets than to believe in a God who is fully capable of creating anything He wants? Just because it's outside our ability to manufacture such a mechanical device, it's okay for space aliens to have the super knowledge and technology to do it, but it's not okay for the God of the Universe to do it!? So, how does one begin to draw or paint an image that, by all human accounts, is an engineering and mechanical impossibility? The answer: We can't . . . . but God did! The word "archangel" derives from two Greek words archo, meaning "to be first" pertaining to political rank or power, and aggelos, which we already know means "messenger". The name suggests that they are the highest ranking among the Angels. The canonical Bible gives the names of only two Angels, one of whom we know is an Archangel and the other presumed to be. identified as "the archangel" in Jude 9. 5"I lifted up my eyes and looked, and behold, a man clothed in linen, with a belt of fine gold from Uphaz around his waist. 12Then he said to me, 'Fear not, Daniel, for from the first day that you set your heart to understand and humbled yourself before your God, your words have been heard, and I have come because of your words. The word "prince" here is the ancient Hebrew word sar, which means "the head person" [of any rank or class], a "chief", a "general", etc. The Bible also says Michael is a warrior Angel who does battle. twice in the Old Testament in Daniel 8:15-26 and 9:21 "while I was speaking in prayer, the man Gabriel, whom I had seen in the vision at the first, came to me in swift flight at the time of the evening sacrifice." in Luke 1:19 "And the angel answered him [Zechariah], 'I am Gabriel. I stand in the presence of God, and I was sent to speak to you and to bring you this good news.'" and in verse 26 "In the sixth month [of Elizabeth's pregnancy] the angel Gabriel was sent from God to a city of Galilee named Nazareth." in Luke 1:26-38 when he appeared to the virgin Mary to tell her of her being selected to bear the Christ child. Although most in the Church believe him to be an Archangel, there is no direct Biblical support for this assumption. Beyond these references, there is nothing in Scripture that enables us to know the unique identities of other Angels. Scripture suggests that the Archangels are Guardian Angels of certain nations and countries. They are concerned with politics, military matters, commerce, and trade among the nations and countries they're guarding. For example, the Archangel Michael is traditionally seen as the protector of Israel and of the New Testament Church. There are three New Testament verses that most Bible scholars believe actually refer to Archangels even though they're translated in the English Bibles as "principality/ies", or "ruler/s" or "other heavenly ruler/s", or "spirit/s", or "demons" [in the NIV]. They believe these verses actually mean "Archangel/s" because in the original Greek text, each one has the prefix arche in it [which we learned earlier, means "to be first"]. Angels are the most familiar to humankind. They are the ones most concerned with the affairs of mortals, which also makes them the most vulnerable to falling into temptation and from grace. It's interesting to note that in all angel hierarchy presentations, the class of "angels" is last or lowest. That is not to infer, however, that they are inferior beings. Rather, they are quite superior to other of God's creation and certainly superior in power and intellect than humankind. Perhaps others who adhere to a celestial hierarchy have ranked Angels lowest because they are the ones who primarily interact with humans and need to be able to relate to humans on a more human-like and less-majestic position. As we've seen in Scripture, whenever other celestial beings represent themselves to mortals in their "natural" form, they cause great fear. However, appearances of human-like beings, with or without wings, not only don't normally engender a fear response but are actually welcomed by most. The remaining angelic "classes" are those whose titles are more about doing than they are about being. Thus, it is impossible to know if these are additional angelic beings  as some who cling to their hierarchy charts believe  or if they're special works performed by the angels previously discussed. Regardless of the outcome, this should not be cause for consternation to either school of thought. The fact is, they are all engaged in carrying out God's will on earth and in Heaven and are graciously provided by God to assist all believers in whatever manner the Lord so deigns. Interesting word choice there, don't you think? "Deign..." It means to do something that one considers to be below one's dignity. However, God's holy angels  regardless of their titles or activities  derive great joy from doing whatever they can to contribute to God's will working in someone's life or to bring glory and honor to Him. They don't feel that any task  no matter how mundane or supposedly unpleasant  is beneath them. So, even if this particular study about them and their duties is so far off-center as to be laughable, they are not insulted because they know it was done with a heart fully devoted to God and to the truth of His Word. Others may be insulted or enraged at such an audacious display of anti-conventionalism that they might label the work heresy! But not God's angels. No. They will applaud, even if the only thing that's accomplished here is that it draws the author into a closer relationship with, or understanding of, God. And they are happy to have assisted thusly. Of course, we know Christ is the Creator and that He created all things including the Angels, Archangels, Seraphim, Cherubim, and Ophanim. He also created the laws by which all things in the universe must consist and interact with one another. By virtue of the word "dominions", we are given to understand this may refer to government or law, both of which, of necessity, extend to authority and justice. These, then, may be considered symbols  whether living or representative only  of God's universal and perfect justice and sovereign dominance. Some of the angelic hierarchy charts combine the word "dominions" with "elders" that appear 12 times in the book of Revelation. However, the Greek word for "dominions" which Paul uses in Colossians 1:16 means "mastery, rulers:  dominion, government"; while the word for "elders" in Revelation means "older; as noun, a senior; specifically an Israelite Sanhedrist (also figuratively, member of the celestial council) or Christian "presbyter":  elder (-est), old." The word "strongholds" is a military term that appears 31 times in the Old Testament and once in the New Testament when the Apostle Paul mentions destroying the strongholds the enemy seeks to erect out of our failings and shortcomings. The word "stronghold" is a derivative of the Greek ekh'-o, a primary verb meaning "to hold (used in very various applications, literally or figuratively, direct or remote; such as possession, ability, contiguity, relation or condition):  be (able, X hold, possessed with)..."
Speaking strictly about the angelic realm, the words "Powers" and "Authorities" appear together twice in Scripture; "Powers" once; and "Authorities" three times. Most angelic hierarchy charts put these two together as having the same meaning. That doesn't seem logical, however, since Paul lists them separately on two occasions. There is also disagreement among them as to whether any "powers" and "authorities" are included among the "fallen angels". Some sources have suggested  without any Biblical support  that these were created after the fall. Well, if these are indeed distinct beings apart from the Seraphim, Cherubim, Wheels, Archangels, and Angels we discussed earlier, then Paul's statement in Ephesians makes it clear that some of them fell from grace. Otherwise, why would we want or need to "wrestle against" them? Paul also used the term "powers" [or "authorities" in some Bible translations] in Colossians 1:16 and Ephesians 1:21. While some scholars believe he was referring to the earthly powers of nations, societies, or individuals, it seems unlikely that he would use the same terms and phrases in one place to refer to the spirit realm and in another place to refer to earthly rule. Nevertheless, there is nothing concrete by which to suggest or assert that they are anything more than attributes of the five clearly-identifiable distinct celestial beings already discussed. These appellatives have already been quoted above; and interestingly, they are all negative. Paul talks about us "warring against" them, Christ "disarming" them, or of them trying to "separate us from the love of God in Christ" . Thus, it seems rather apparent that these do not refer to God's celestial servants. And if they are not a part of God's heavenly realm, then certainly, they are not distinct beings. Rather, they are attributes of beings already discussed. 1"Seraphim, Virtues, and Angels, Oh My", Beliefnet. np. Web 10 February 2013. 2"Angelic Hierarchy", Archangels and Angels. 17 July 2009. Web. 22 January 2013. 4"Cherub", Wikipedia, the Free Encyclopedia. 19 January 2013. Web. 20 January 2013. 5"Ophanim", Wikipedia, the Free Encyclopedia. 22 January 2013. Web. 22 January 2013. 6"Dionysius Hierarchy of Angels", Angel Focus. Copyright © 2009. Web. 25 January 2013. 7Seven Spirits of God are not specifically identified, so it's impossible to give a definite answer. Revelation 1:4 says they are before God's throne, Revelation 3:1 says that Jesus Christ "holds" the seven Spirits of God, Revelation 4:5 links the seven Spirits of God with seven burning lamps that are before God's throne, and Revelation 5:6 identifies the seven Spirits with the "seven eyes" of the Lamb and states that they are "sent out into all the earth." They are symbolic of the Holy Spirit because the number 7 refers to perfection and completion. Thus, it could refer to the perfect and complete Holy Spirit. They are seven angelic beings, possibly the seraphim or the cherubim. This would fit with the numerous other angelic beings that are described in the book of Revelation (Revelation 4:6-9; 5:6-14; 19:4-5). Based on Isaiah 11:2, they are the (1) Spirit of the LORD, (2) Spirit of wisdom, (3) Spirit of understanding, (4) Spirit of counsel, (5) Spirit of power, (6) Spirit of knowledge, and (7) Spirit of the fear of the Lord.